The VWR Incubator Model 1535 offers superior uniformity and ample storage space in a simple to use incubator. This incubating oven has a uniformity of ±0.25C at 37C thanks to the heating elements that surround the chamber for a even heat without hotspots. The temperature range of this incubator ranges from between 5°C above ambient and up to 70°C. and can be easily set from the up top digital control panel. At that microprocessor-controlled panel, users can also choose their over temperature safety dial, with visual alert. The interior of the VWR Model 1535 Incubator is an easy to clean polished stainless, with adjustable shelving and a through wall access port to allow for external monitoring and a vapor sealed electrical outlet for supporting instruments. Users of this 6.7cu ft capacity incubator can quickly check on sample progress without drastically disturbing conditions thanks to the full-length tempered glass door that covers the chamber. 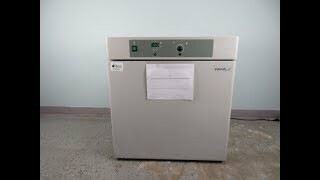 This VWR Incubator Model 1535 has been fully inspected and is operating without issue. All of our lab equipment comes backed with our standard warranty. Should you have any questions, please don't hesitate to contact us.